Hostas do not get nearly enough attention for being the amazing plants they are. They are so simple to grow and can provide endless beauty for your yard. Aside from their easy care and beauty, there are even more reasons to grow these wonderful perennials. 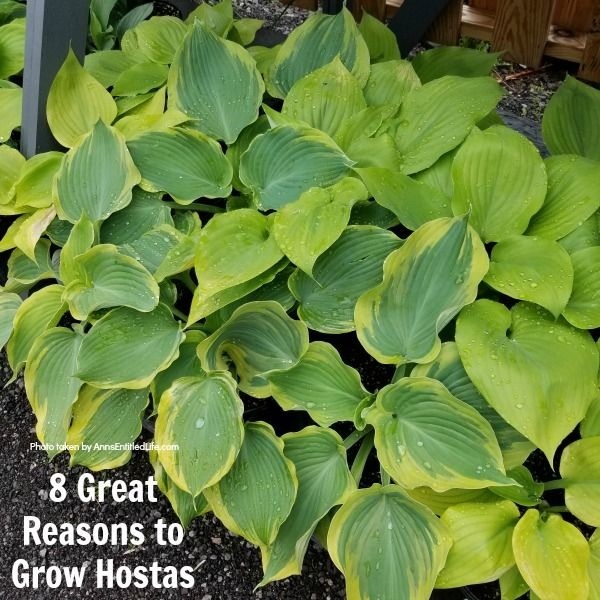 Look below at these 8 great reasons to grow hostas, and see why this is a plant you should add to your yard this gardening season. One of the best things about hostas is they are affordable for all budgets. You can find seedlings for as little as a few bucks at your local garden center, Lowes or Home Depot. You may even find well matured hostas for around five bucks. This allows you to cover a great deal of space even if you are pinching pennies. Have a friend that has hostas? They are simple to divide ie, free plants! In the spring or fall, divide existing hostas into more plants. To divide hostas, simply dig up the entire clump of the mature plant from the ground (use a shovel). Use a sharp knife to cut the roots of the plant into sections. Wash the soil from the roots before re-planting. click here for an in-depth video on how to divide a hosta. If you live in an area that gets more shade than sunlight, do not worry. Hostas will thrive in the shade (not deep shade, however) They do not require long lengths of sunshine to grow well, so they are ideal for shadier gardens. While hostas are generally considered shade plants, there are varieties that do well in part-sun situations. Check the hostas you are buying. 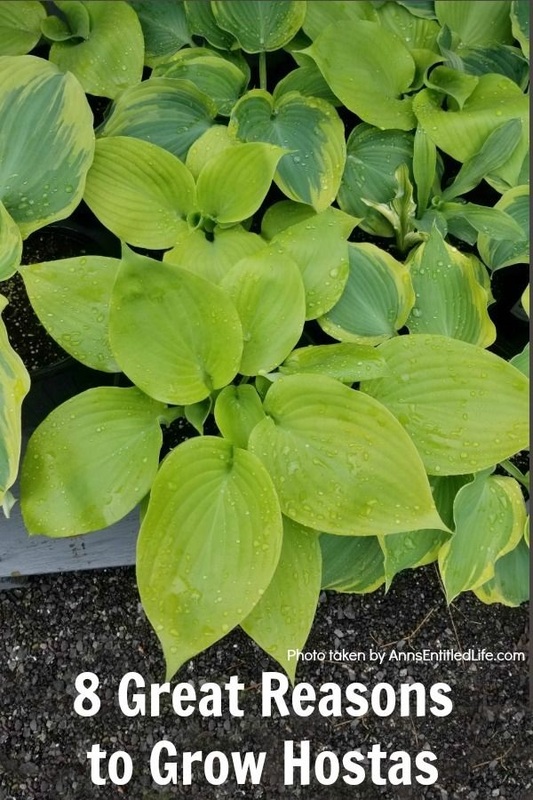 Hostas varieties with thicker leaves tend to tolerate the sun better. Because hostas are low to the ground and spread out, they offer shade for beneficial bugs to take a break from the heat. Bugs such as preying mantis and ladybugs love hostas as they provide an umbrella of sun protection. If you want bang for your buck, hostas are it! For just a few bucks you can buy a plant that triples in size in just a year or two. They cover space quickly, making them ideal to fill in large garden spaces and hard to fill places. Hostas are very forgiving. You do not need to be a master gardener to grow them. As long as they get regular water and are planted in well-draining soil, they will thrive. They are ideal if you are not home to maintain your yard often, or if you want some lovely plants but just do not have the time to fuss with them. Most people think hostas just come in basic green leaves and are therefore dull and boring. But the truth is you can find them in all sorts of shades of green, white, silver, blue tones, and even flowering. Create an entire hosta garden of all the various kinds and see how much of an assortment there really is! So in conclusion, hostas are a great value plant. They are inexpensive, can fill in large bare spots in your garden fairly quickly, like the shade, and can tolerate a little benign neglect. Now is the time to consider hostas. 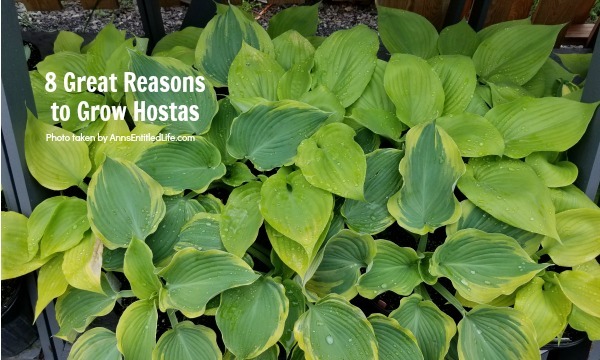 Consider all of these reasons to grow hostas and see what wonderful plants they are! • 75 Acid Loving Plants – If you have acidic soil, you need plants that flourish within an acid soil environment. Flowers, vegetables, shrubs, and trees all have specific soil needs; these 75 acid loving plants are great choices for your gardening and landscaping needs. • 75 Alkaline Friendly Plants – If you have alkaline soil, you need plants that flourish within an alkaline soil environment. Flowers, vegetables, shrubs, and trees all have specific soil needs; these 75 Alkaline Friendly Plants are great choices for your gardening and landscaping needs. • 10 Best Low Light Houseplants – If you have a darker room without a lot of natural sunlight, do not despair – you can still grow houseplants indoors! Here is a list of the 10 Best Low Light Houseplants to grow inside. You may be surprised to find so many great options when it comes to growing indoor plants in low light conditions.